Can’t wait to see Wonder Woman in her own feature flick? Well, you don’t have to! 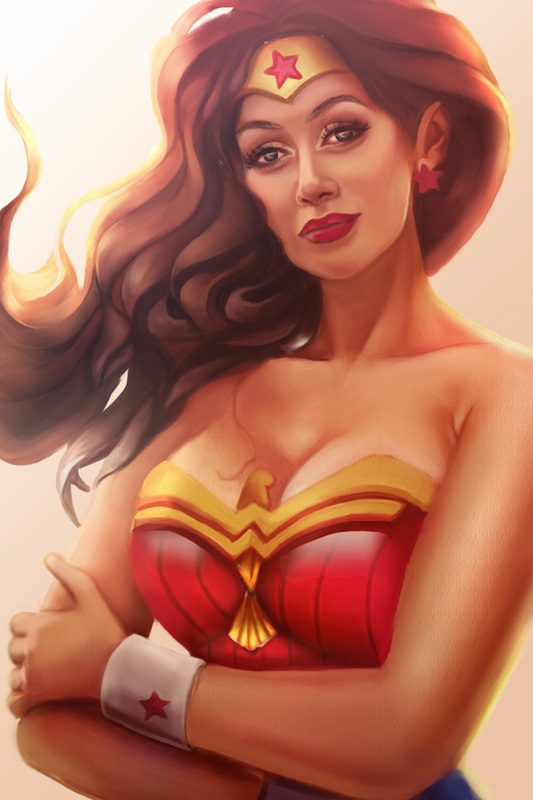 Follow along as we take you through this amazing portrait of Wonder Woman in Photoshop CC. 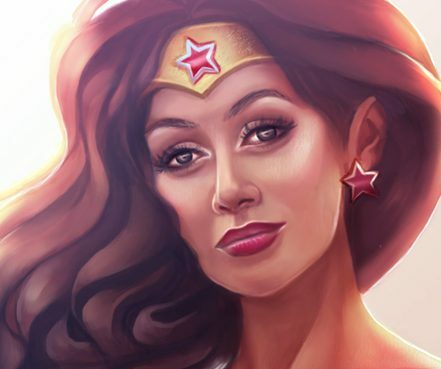 Learn how to digitally paint your own superhero portrait using nothing but a graphics tablet and a good reference photo. Let’s get started! 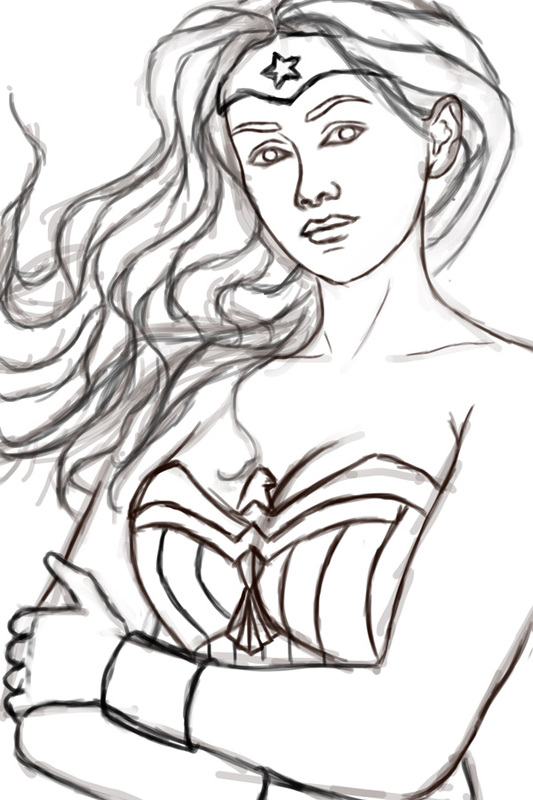 We’re going to cheat the process a little for this sketch by relying on a photo reference for the pose. Having a graphics tablet makes painting so much easier, so make sure you have one before you start drawing or painting. Open a New Document in Photoshop at 1119×1678 pixels at 300 dpi. Copy and paste the reference for your pose onto the document and resize it to fit the screen by pressing Control-T to Free Transform. Lower the Opacity of your reference to 50%. Create a New Layer above the reference and use a Hard Round Brush (B) to start tracing the full pose. Include guidelines for the face on this trace. When you’re finished tracing the model’s pose, Delete the reference layer. 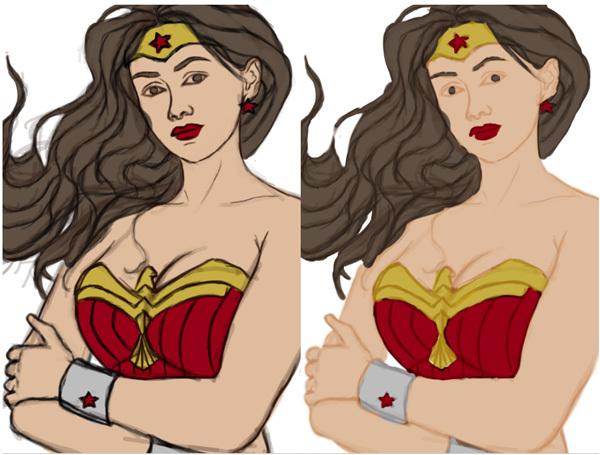 This trace now makes it ten times easier to draw Wonder Woman! Now lower the Opacity of the trace to 60%. Create a New Layer above the trace and use it to draw all of wonder woman’s features with a Hard Round Brush. 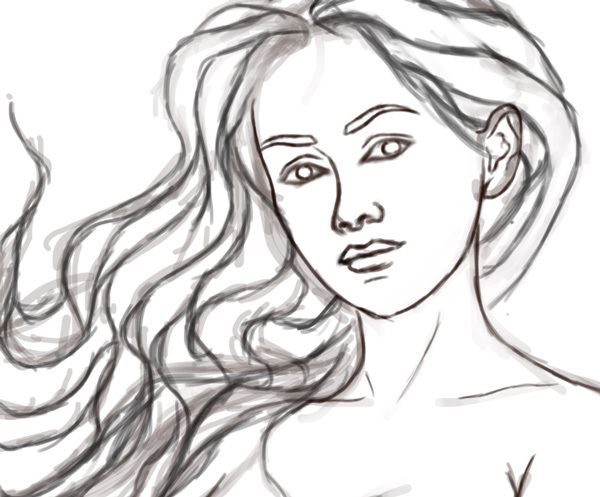 Start with the face and hair. Then move onto the outfit. Find references for her costume online and add your own design magic to her outfit. Some signature details you can include are the Americana stars and the eagle on her corset. Try to make this sketch as clean as possible because it’ll make the painting process much easier. Here is the final sketch. When you’re done with the sketch, Merge all the sketch layers together. 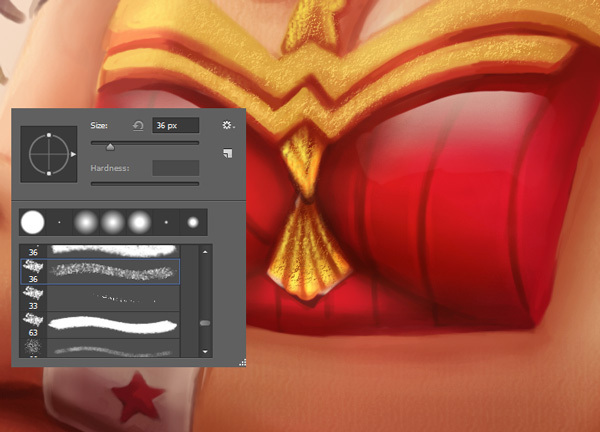 For this entire painting I will be using these two brushes, the Hard Round Pressure Opacity Brush and the Soft Round Pressure Opacity Brush. Organize the painting by placing the sketch into a New Group named, “Painting.” Place the sketch into the group and add a New Layer underneath the sketch, name that layer “Base Colors.” Use a Hard Round Brush at 100% Hardness to paint the solid base colors for the painting. 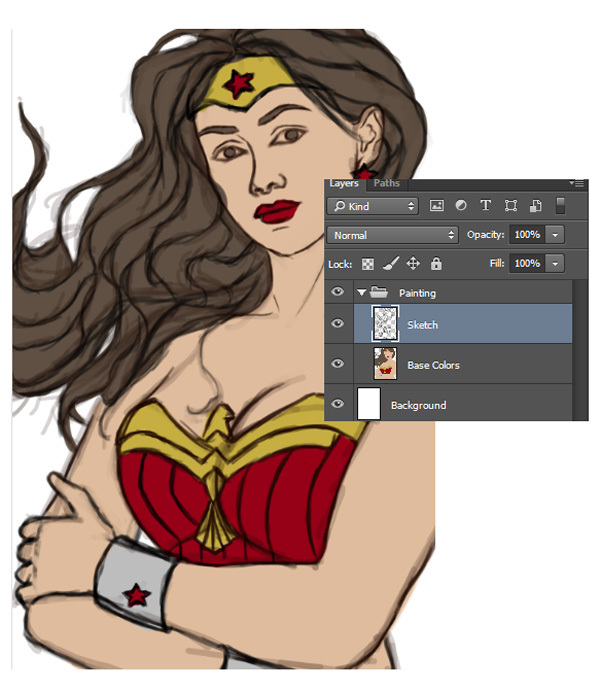 When you’re finished, set the Sketch Layer to Soft Light so that it blends into the base. Now let’s paint the shadows! Add a New Layer above the base colors. 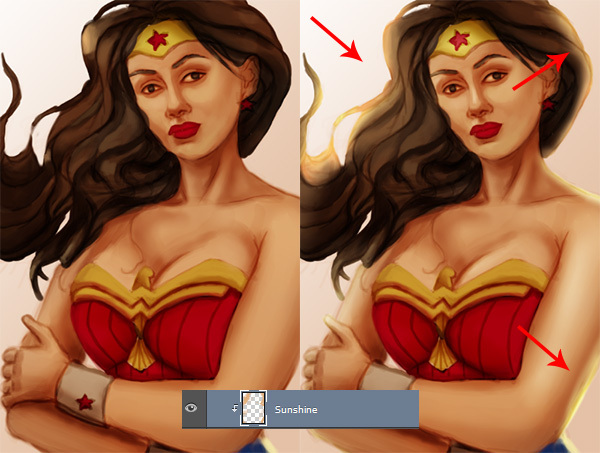 Right-click the layer and select Set as Clipping Mask so that whatever you paint stays within the borders of your base. Now set that layer to Multiply and name it “Shadows.” For each base color, set that color as the Foreground Color with the Eyedropper Tool (I), then use those same base colors to help sculpt the painting with shadow. 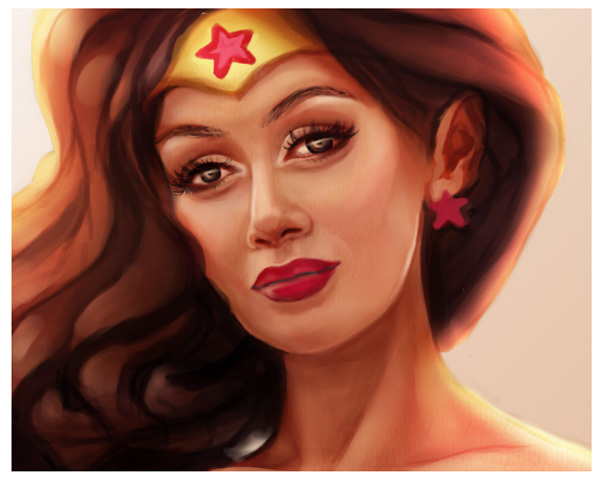 I want Wonder Woman to have the same awesome warmth that the original photo has. To do this, I’ll set a New Layer above the shadows to Overlay and use the same skin color to paint warmth all over the painting. 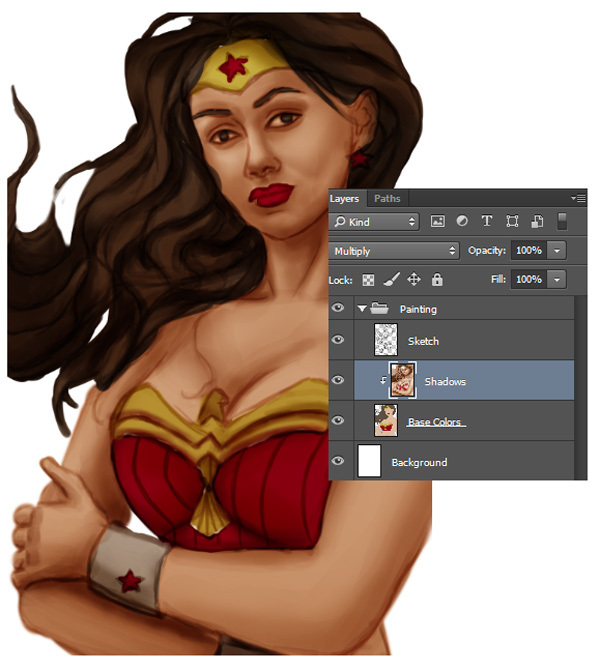 Merge all the painted layers for the wonder woman portrait together. She should still be separate from the background. I want a strong portrait so the background will be simple. Create a New Layer underneath her and use the Gradient Tool (G) to paint a diagonal gradient with a light tan color at 50% Opacity. Let’s get back to painting. You can use the same method we used before with the clipping masks or just directly paint onto the newly merged base. Set a New Layer above the base to Linear Dodge (Add) and use a light tan color to add a sunny highlight all around her body. Concentrate the sunshine light behind her hair for a beautiful effect. Merge the sunshine layer with the base. 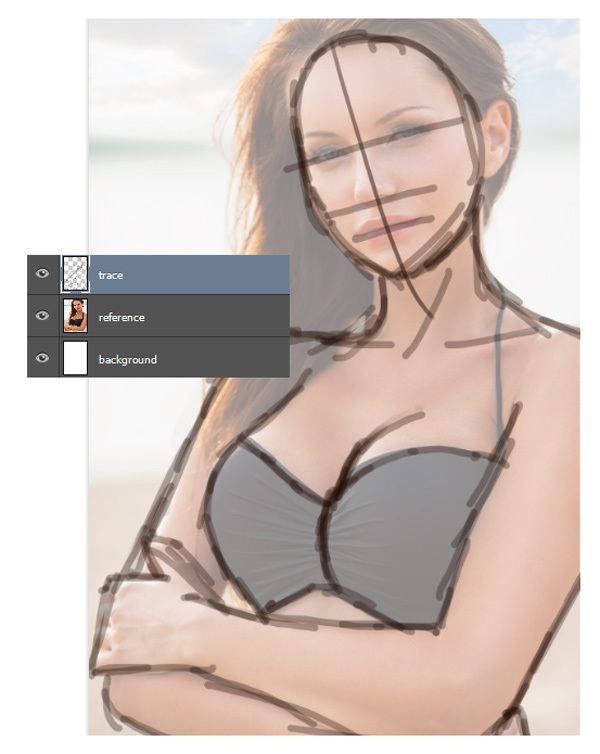 Now paint more shadows and highlights directly to the base layer to sculpt and define your portrait. Use a combination of the Soft and Hard Round Brushes to smooth out the skin and define the details. Zoom into the painting so you get a better handle of each detail. Make sure you’re still using the original reference as a guide. Paint more warmth into the hair and paint features like eyelashes and eye makeup for a sultrier portrait. Set a New Layer above the base to Linear Dodge (Add). Paint strong highlights onto the skin and outfit using both white and tan colors. Concentrate the highlights on the highest points of her face to make the painting more realistic and 3D. Add shine to her eyes and don’t forget the tiny hair strokes for her eyebrows. Use this same layer to intensify her outfit. 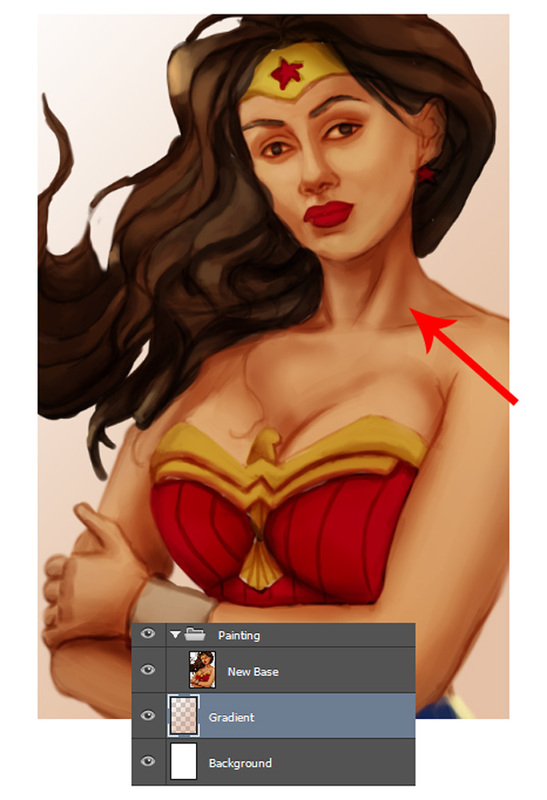 Use solid white to paint white highlight on her bosom and the yellow from the eagle to add a golden shine. Start to sharpen the details of this portrait by using a brush set to 100% Hardness. This will help make the edges crisp and keep it from looking blurry. 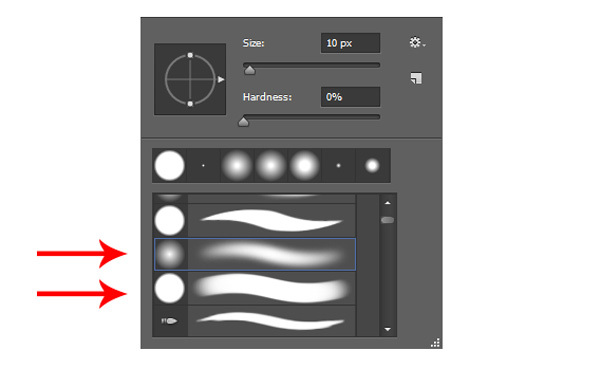 Use the Chalk Brush from the Brush Presets to add texture to the eagle. Add a lighter yellow to make the outfit appear more grainy and leathery. 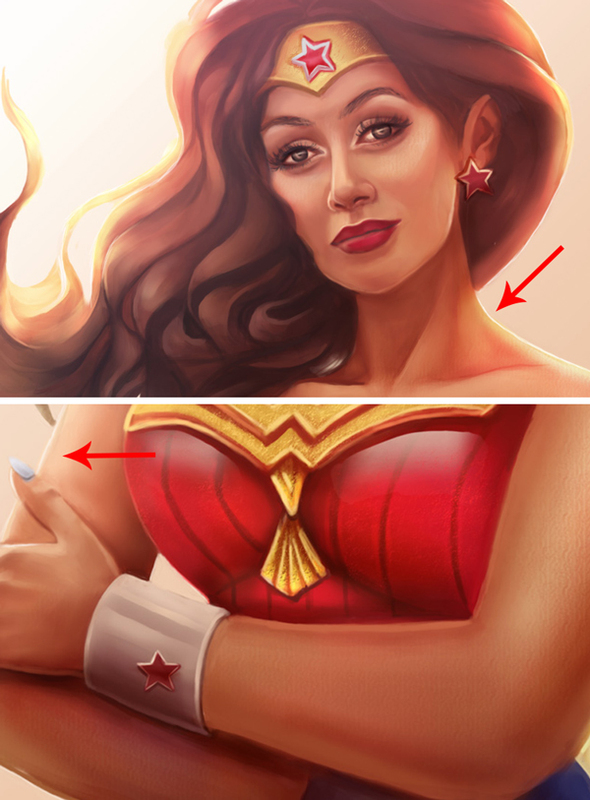 Finish off your painting by making sure details like the eagle, arm cuff, head band, and others have sharp highlights around them. These highlights will make your painting look crisp and realistic. 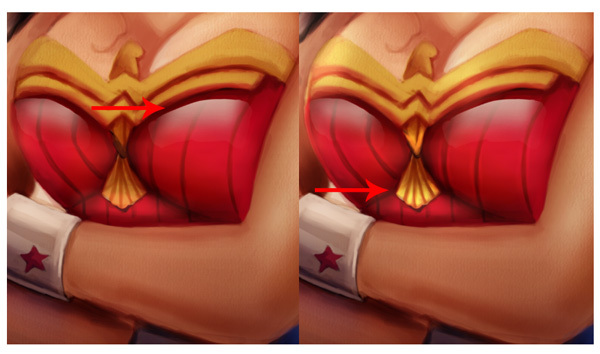 Rework the depth of these details by adding more shadows according to the current lighting scheme. Continue tweaking the portrait. 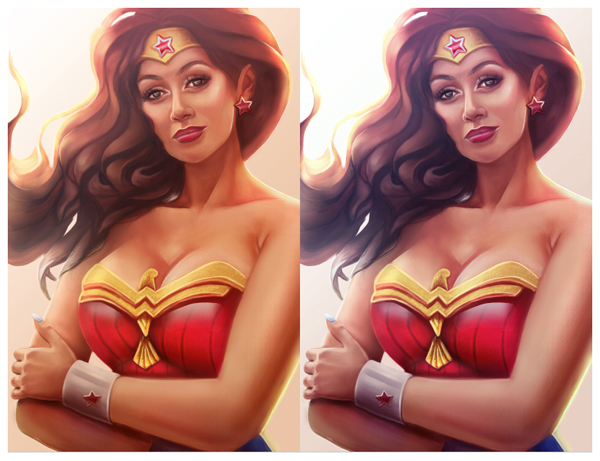 Since the portrait is looking a little warm, let’s add a New Adjustment Layer for Color Balance. Adjust the Midtones to: Red -52, Green -34, and Blue +34. Then adjust the Highlights to Red -17, Green +2, and Blue +15 for an interesting color effect. When you’re finished, your awesome portrait will look like this! I hope you’ve enjoyed this tutorial, take your time in studying the steps and practice often to improve your portraits. Good luck and enjoy the movie!